Cheater Quilt Panel + Pieced Blocks: "Field Puzzle"
When I designed my "Dogs at the Farmers Market" fabric last summer I discovered that it was difficult to fussy cut the fabric without wasting more of the adjacent design than I wanted to. It was a good lesson to learn early in my fabric designing adventure. In my last post I introduced my "Fox and the Four Seasons" fat quarter panel available at spoonflower.com. I designed it so it can be cut into blocks. It's a first step in thinking about how to design a "cheater" quilt panel. Before I do that, I decided to see what other indie designers on spoonflower.com have done with "cheater" panels. This quilt was made with one of 3 "cheater" quilt panels I've purchased. This is "Puzzle Wholecloth/charcoal ombre" by ivieclothco. I love the printed ombre which could be pieced, but would be a challenge to collect the perfect colors. I've added pieced blocks around the perimeter and appliqued 2 blocks onto the central panel to make it my own. 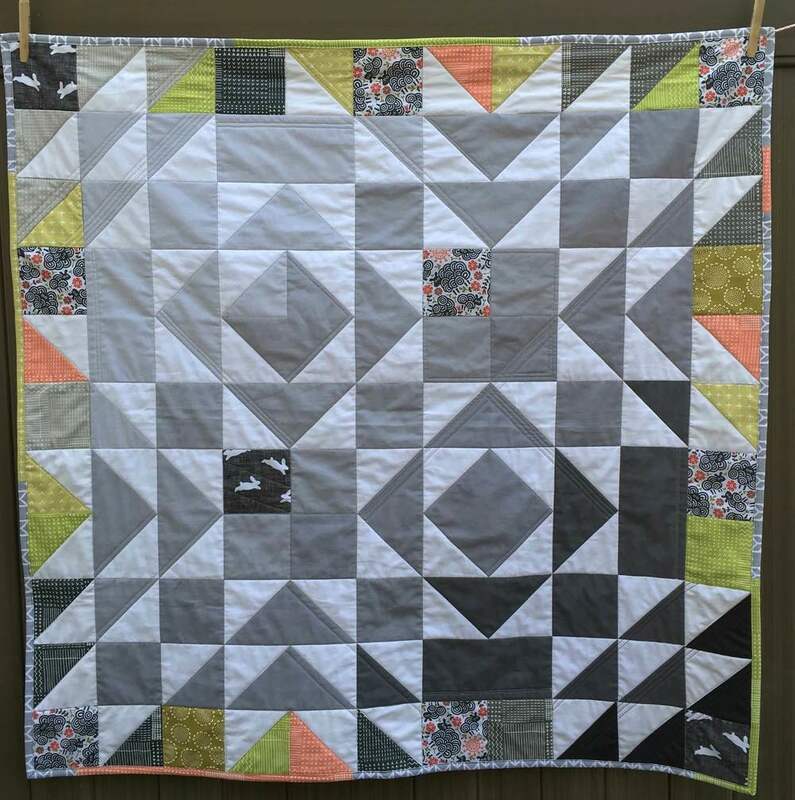 I used two other designs by ivieclothco, "Bunnies White on Charcoal Linen" in the blocks and "Double Chevron Gray Linen" as part of the binding. The fabulous sheep fabric, "Black Sheep Sanctuary" is also from a spoonflower designer, christinewitte. I used the color way in her fabric to pull fabrics from Karen Lewis' "Blueberry Park" collection and used Kona® for the solid colors, both lines from Robert Kaufman Fabrics. I kept the panel intact for this quilt. It wasn't possible to cut the wholecloth panel into blocks. It was intended to be used as printed so there was no seam allowances in the design. It was a lot of fun working on this project. Here's the back. The main fabric on the back was in my stash. In my next 2 posts I'll show a quilt where the designer designed a quilt panel that could be used as-is or cut into blocks.